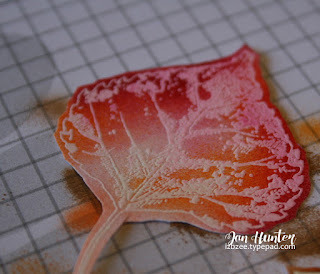 I <3 embossing! For this project, I used the Teresa Collins Herringbone and Hounstooth A6 folders. I hope you can see it in the details. 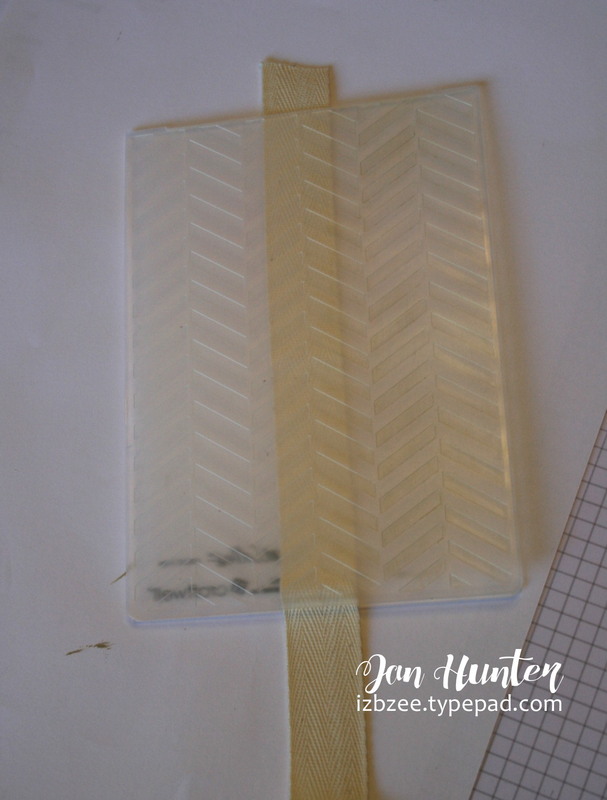 Even the twill tape has the Herringbone design imprinted on it using the folder and some ink. Stamp and heat emboss the leaves, Set aside. Emboss a piece of card stock measuring 4 x 5.25 using the Houndstooth folder. Using the Herringbone folder, emboss the left side of a piece of cardstock measuring 2.5 x 5.5. Using the herringbone folder, slide the twill tape through the center area at the fold. Flip the tape up and ink the bottom side of the folder where the tape will lay. 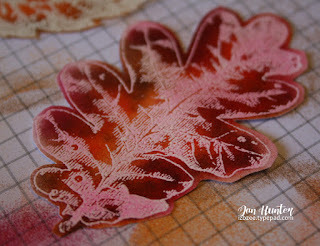 Lay the twill tape on the inked portion and press with your hands or a brayer being careful that the tape doesn't move. The pattern will be pressed into the tape. Remove the tape. Repeat as needed for the remainder of your tape. Heat set ink if needed. "Pleat" the tape and if desired stitch or staple. You could also use glue dots to secure the pleats in place. Clip the ends into an inverted V. Set aside. 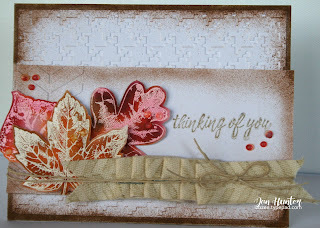 Using the eBrush, edge the sides of the white cardstock the base and the smaller piece using the brown (977). Set those pieces aside (oops, no picture os this step). Using the lightest colored marker in the eBrush, begin coloring the leaves. Add layers of color wiping excess off off the embossed areas. Trim the leaves. 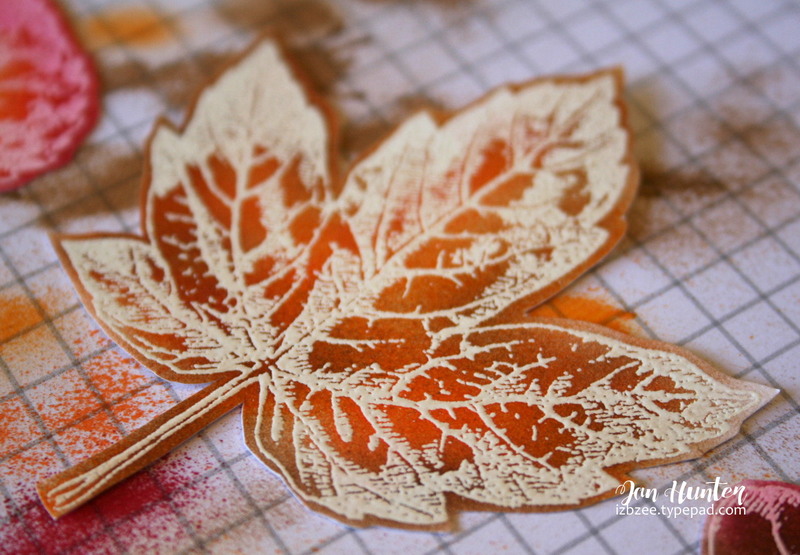 Arrange the leaves on the strip of paper, adding pop-up dots as desired for some added height. Stamp the sentiment to the same strip. Add the twill tape using glue dots to secure. Wrap some twine around the whole strip of card a couple of times. Finish the twine as desired. Secure the large embossed cardstock to the card pase. Add the strip securing with tape or glue. Add any additional elements as desired. 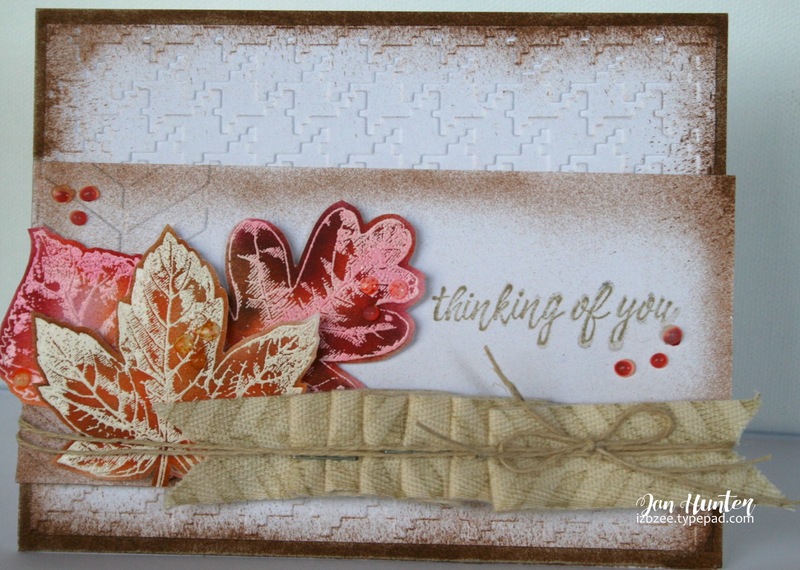 Change the dimensions to 4x6 and choosing a fall sentiment, this would look very nice framed. 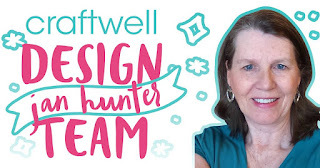 Wishing you happy crafting and don't be afraid to mix textures with embossing folders OR to add more dimension using the folders and ink to tape or ribbons. There's lots of fun to be had. Wishing you time in your crafting room this week and every week! Beautiful card and design! 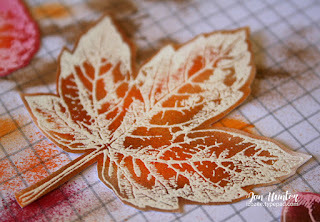 The embossing looks awesome and I love those leaves, so pretty!